Beer is certainly the most common outdoor activity beverage - it’s become associated with the outdoors in the form of the summit beer, the chairlift beer, and the parking lot beer. But what makes beer any better than wine when enjoying the great outdoors? There’s no reason we can’t celebrate a stomped landing or mountain trek with a glass of wine instead of a pint. Some might say wine isn’t as portable as beers can be, but those people certainly haven’t met us. There are, in fact, many ways to enjoy your vino in the great outdoors. Here are our favorite camping friendly receptacles for when wine time comes calling. If you prefer to sip your wine while delicately pinching the glass stem and feeling fancy, our nesting wine glasses are the right choice. Luckily, we have two shatterproof, nature-friendly materials to fit your needs. For those whose wine-related excursions require the least amount of added weight, our BPA-free Copolyster nesting glasses are the way to go: available in Red and White sizes. If you prefer a little heftier wine glass, choose the Glacier Stainless nesting glass - also available in a red wine-specific shape if you’re into that. For those who prefer to grab life by the horns and wine glasses without stems, we’ve got something to suit your fancy. Enter the Stemless glass: available in White bowl size, Red bowl size, and a Stainless Steel version. Rugged and outdoorsy just like you, the stemless glass is surprisingly stable for resting on the uneven surfaces you often come upon when wining in the outdoors. If your wine indulgences tend to get a little tipsy, we’ve got a glass for you: the brand new Glacier Stainless Double Wall Wine Glass. This glass is equipped with stellar insulation technology to keep your drinks just the right temperature, no matter the weather. The included sip-top prevents spills and sloshing, which can be inevitable enjoying wine in the elements. This glass also doubles as the perfect coffee mug, cocoa cup, or margarita glass - you name it. The double walled world is yours. 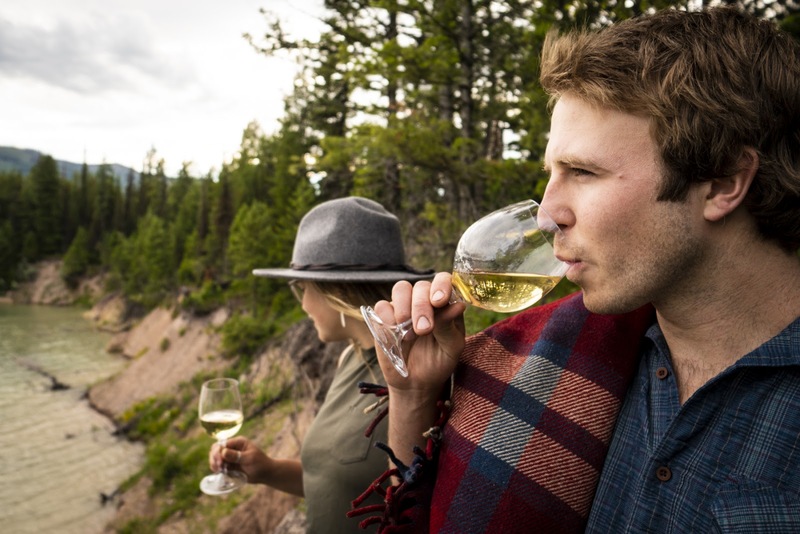 What if you desire the full wilderness wine experience? Have no fear - the Wine Glass Gift Set is here. Insulated wine tote (with easy-carry strap) holds a full bottle of wine without the weight and danger of bringing a glass bottle into the backcountry. But wait - there’s more! The carry case folds out to hold the two included nesting wine glasses we mentioned earlier - so you can sip and share with ease wherever you please. Wine tasting in the outdoors doesn’t get much better than that. Now nothing is holding you back from taking some wine along on your next adventure.